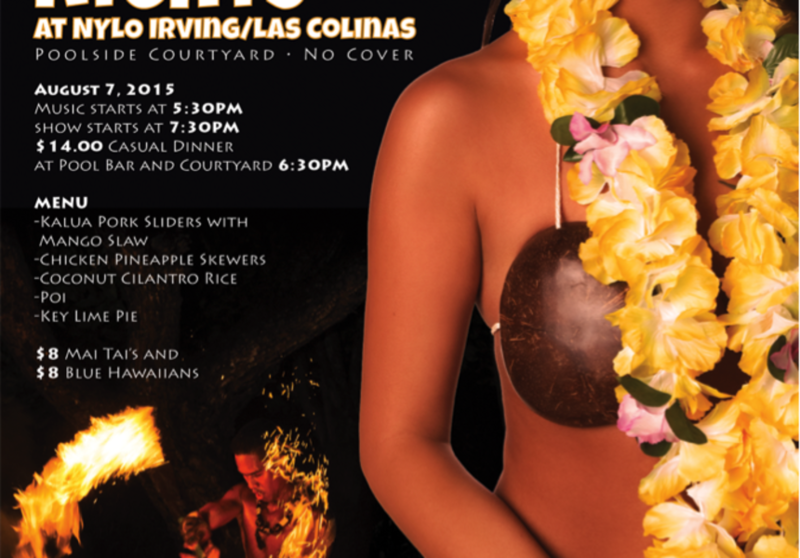 Irving, TX, August 7, 2015 – NYLO Dallas/Las Colinas is having a Hot Hawaiian Nights Luau at the Poolside Courtyard – No Cover. Guests will enjoy $8 Mai Tais and $8 Blue Hawaiians. $14 Hawaiian dinner menu to include: Pulled pork sliders with mango slaw, chicken pineapple skewers, coconut cilantro rice, poi and Key Lime Pie. Guests will also be treated to live music Watusi, Bali Hai from 5:30PM – 7:30PM with the Hawaiian Dancers starting at 7:30PM. Grand finale performance by authentic Honolulu, Hawaiian Dancer eating live fire - too hot to handle! Cost: No Cover - $8 Mai Tais and $8 Blue Hawaiians. $14 - Hawaiian dinner menu to include: Pulled Pork Sliders with mango slaw, chicken pineapple skewers, coconut cilantro rice, poi and key lime pie. A NYLO stay is a lifestyle experience in a highly social atmosphere rich in design, art, music, energy and comfort. NYLO Hotels&apos; contemporary custom furniture and fixtures provide a comfortable, residential feel; and destination bars and restaurants blend an urban ambiance with the local market for a truly one-of-a-kind experience. NYLO has five locations across the country, including New York City; Warwick, R.I.; Las Colinas, Texas; Plano, Texas; and Dallas, Texas. Visit www.nylohotels.com for more information.